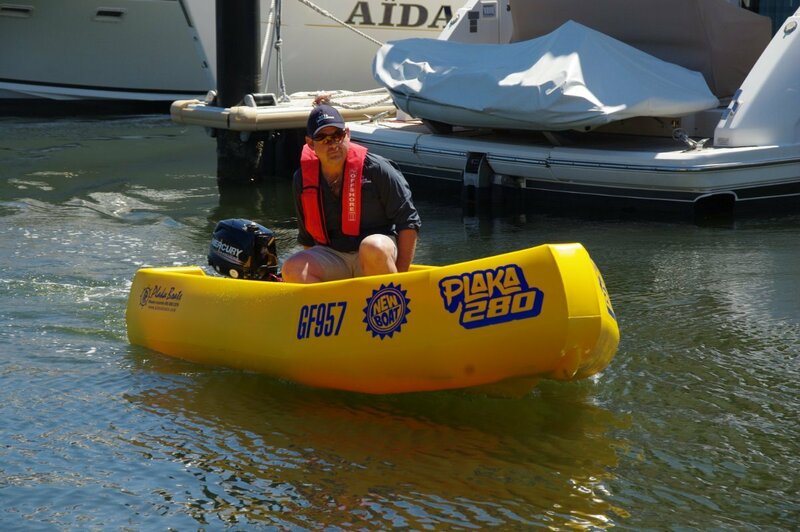 Plaka has been building roto moulded boats for 20-odd years, and a 2.8 metre model has featured for much of that time. Internally it was about as tight a fit as a length of 2.8 metres might suggest, and that was because the design was similar to an inflatable: side tubes that devoured room. Thoroughly acceptable in larger sizes but a handicap here. The new generation 280 fixes that in spades with everything above the floor being new and offering far more internal beam. Making it new is a very big deal in the roto moulded world, requiring complex new moulds. It was definitely worthwhile. world, requiring complex new moulds. It was definitely worthwhile. UV-stabilised polyethylene has so many advantages as a marine material that I am perpetually baffled so few boats are built using it. This is as close as anything gets to indestructibility. It is so slippery, especially when wet, that it is difficult to scratch. If you do manage a scratch you will have trouble seeing it because the colour goes all the way through the material. Unlike aluminium it is fatigue-free and is happy to bend and return after a big hit. Industry is the great fan of poly boats. You see them on tailings dams – they do not corrode, and in oil spill operations – oil does not stick to them very tenaciously. The big user is aquaculture, which likes every poly characteristic. Of course, their slipperiness and relative softness makes them a natural tender to larger boats. The new 280 will happily take on that role. It is also the right size and weight to fit on a camper trailer. With two on board we had a useful amount of room left over for fishing gear or re-supply for the mother ship. Three is the official people capacity, and there would be no crowding with that number embarked. Construction is double skinned and foam filled throughout. The cavity between deck and bottom uses two-pack, foamed in place, creating a stiff structure with immense strength. The sides have slabs of foam that do not fill the space tightly. This allows the poly to flex a little if coming alongside vigorously or otherwise banging into something. All this foam and its distribution give the 280 level flotation, or in other words if it were swamped it should float upright and level with a full passenger load on board. The 280’s recommended power is 6hp. A significant figure, as it means no Skipper’s Ticket would be needed to operate the boat. If you dropped it to 5hp, you would not even need to register it provided it was used solely as a ship to shore tender to a mother ship. 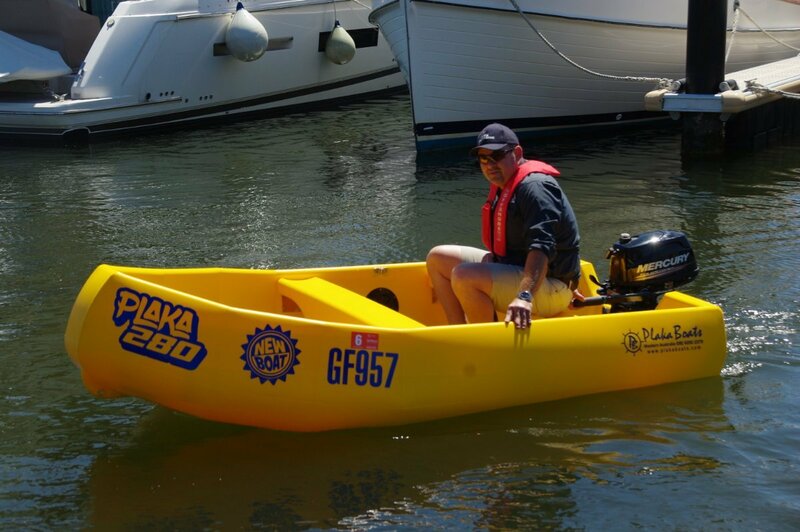 Our 280 had a 6hp Mercury and it gave surprisingly good performance. Speed flat out was 15-16 knots, determined by wrist watch and mental arithmetic (all right, ball point on the palm of the hand). One great advantage the 280 has over aluminium dinghies is seats that do not become incandescent after a few minutes in the sun. The thwart-style seats are an all-round neat piece of design. In the centre they dip down to meet the deck, giving them strength and forming compartments with twist-on access hatches. Either side of these is foot room and exposure to the whole interior length giving stowage for the oars. The whole interior is neat and clean. No question this is a small vessel; possibly as small as any I have reviewed, but once aboard it feels bigger. I have been in dinghies where the slightest shift from the centre line caused major boat movement. Here, not so; it has reassuring amounts of stability. Driving vigorously with hard turns revealed no twitchiness. Most camping trips involve just two people per vehicle. 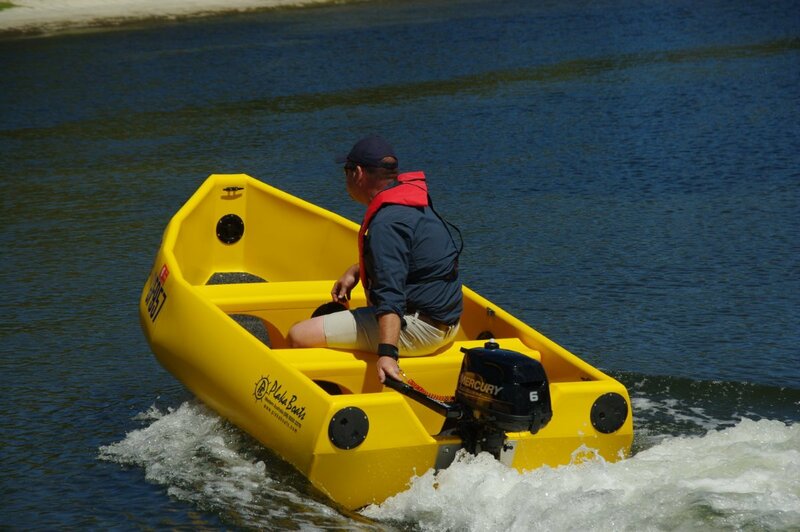 This could be the right sized boat for that couple to fish from or go exploring in.